Howard & Sons, the leading pyrotechnics company in Australia, has representatives all over the country ready to help and advice with the design and creation of your event fireworks or special effects. Our many years in this exciting sector means we can bring our custom fireworks and special effects safely to your event anywhere in the Northern Territory. 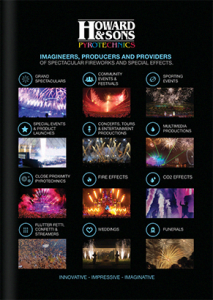 Howard & Sons Pyrotechnics have always kept up with the most recent technologies, designs, materials, rules and regulations. There is nothing we don’t know about making your pyrotechnic extravaganza dramatic, exciting, awe-inspiring, and very, very safe. Howard & Sons can bring an arena, stage, park, harbour, hilltop or even community centre to life, from Darwin all the way down to Alice Springs. With specialised and experienced teams for one-off or regular, outdoor or indoor pyrotechnic special effects for theatres, private and corporate events, bands, movie shoots, photo shoots, circuses and sporting events, we know exactly what is possible, and what is safe. For the largest audiences, Howard & Sons Grand Spectaculars combine futuristic displays with centuries-old ingredients. If you are looking for knowledgeable and ground-breaking pyrotechnicians for your smaller scale wedding fireworks display, or your huge-scale staged event anywhere in Northern Territory, please contact our Howard & Sons Pyrotechnics Darwin representative. The information is listed below. Naturally, all of our pyrotechnicians working in the NT region work according to NT WorkSafe regulations. At Howard & Sons Pyrotechnics, every day is Territory Day. In fact, you might not need much convincing to drop us a line. You may have already seen Howard & Sons fireworks and multimedia special effect presentations in NT such as the Magic over Mindil Skyshow, Royal Darwin Show and a few Darwin New Year’s Eve spectaculars. We design elaborate or simple but effective displays with or without multimedia, lasers, water screens, confetti cannons and any other type of explosive entertainment. No matter how complex, our position as the leading Australia firework manufacturer and firing system frontrunner means the greatest part of the Australian sky has been decorated with our cutting-edge spectacles at some time or other during the past century. Give us a call today and see how our Darwin pyrotechnician team will make your event an occasion no one will ever forget.